Your Ring Alarm kit came with a keypad, but you can expand your system with additional keypads for added convenience. Your Ring Alarm kit came with a keypad, but you can expand your system with additional keypads for added convenience. A keypad by the back door or garage would come in handy for arming or disarming the system. Add one to the master bedroom for quick access in case of a false alarm. And if you've got a Ring Protect Plus plan, you can use it to trigger a panic alarm that will quickly dispatch police. Disarmed: Use disarm mode when you are home and want the freedom to go in and out of the house. When disarmed, the system will still be powered on and functioning, but no sensors will be monitored and no alerts will be sent. Home Mode: In home mode, only certain sensors will be monitored. Which ones? It's up to you. Use the Ring app to customize this mode. For example, you might use home mode when you've gone to the bed for the night, so you can have the system turn on all contact sensors and the downstairs motion detectors. 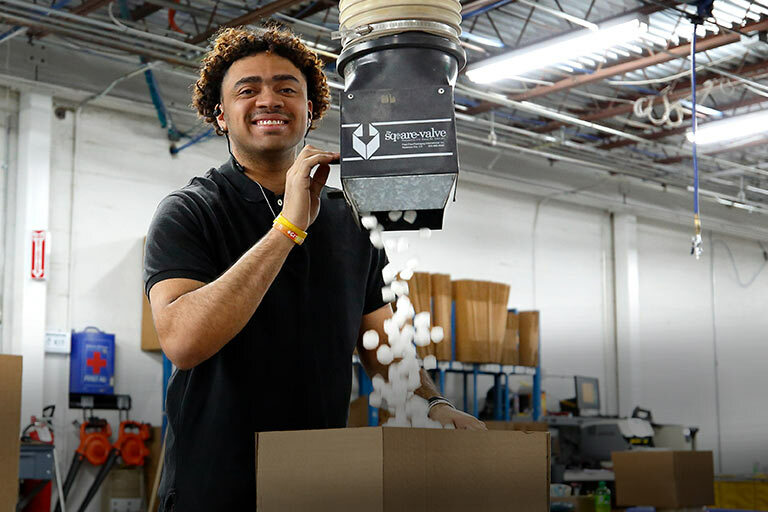 Away Mode: When the system is in away mode, all of your sensors will be monitored and an alert will be sent if they are triggered. You would use away mode only when there is nobody at home. 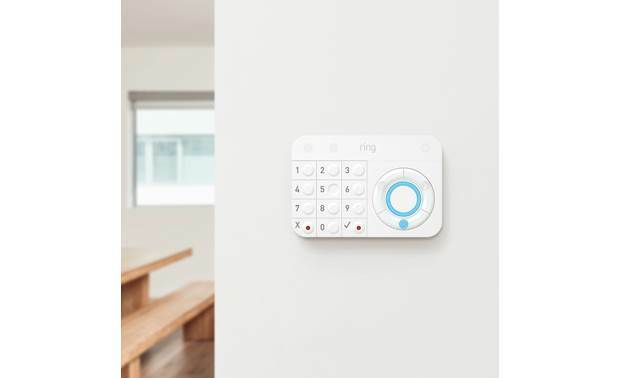 Overview: The Ring Alarm Keypad lets you arm or disarm your Ring system when you don't have access to your smartphone or the Ring App. It connects to the alarm Base Station via Z-Wave, which gives you a 250-foot range. This allows you to place additional keypads in your garage, bedroom, upstairs, basement, or other convenient locations. The Keypad features numeric keys 0 through 9, "X" and "checkmark" buttons, and LED indicators. 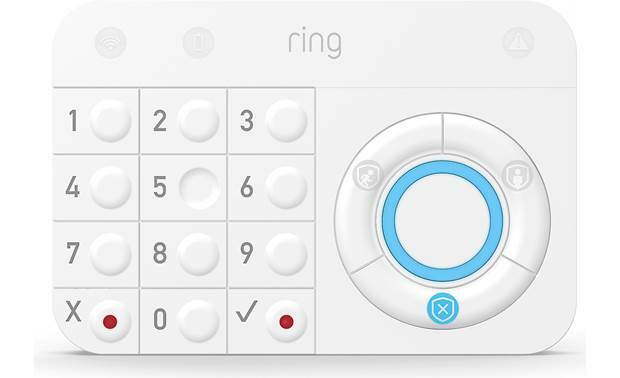 The Ring Alarm is protected by a unique 4-digit Owner's Access Code, which is entered on the keypad or the Ring App. LED Indicator: The blue LED "ring" on the Keypad shows the current connection status of the device. When you power on the Keypad, a rotating blue ring shows it is waiting to connect. When the Keypad is connecting, the ring blinks blue, then glows solid blue for 5 seconds when connected. The Keypad also has indicators for Network, Battery, and Faulted Sensors (bypass). Away: All of the connected sensors are activated. Disarmed: No sensors are activated, allowing you to freely move about your house. Home: Select sensors can activated, while leaving others turned off. 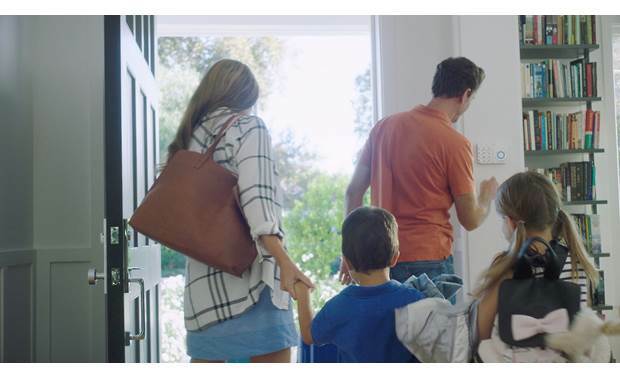 For example, you can turn off the Motion Detectors while you're at home, but keep the Contact Sensors activated to protect your doors and windows. Panic Mode: You can trigger the Panic Mode by simultaneously pressing the "X" and "checkmark" buttons on the keypad. Power Requirements: The Keypad comes with a 79" cord and an AC adapter that plugs into to any standard power outlet. The built-in rechargeable battery keeps the keypad operating during power outages. Keypad Placement: The Ring Alarm Keypad comes with a reversable quick-release bracket. The bracket has two keyhole slots for wall-mounting the device using the two provided screws and wall anchors. Flipping the bracket and attaching the Keypad to the other side creates an angled, tabletop base. Searches related to the Ring Alarm Keypad Control pad for Ring Alarm system.